With spring just around the corner, the thought of an outdoor kitchen may become more and more appealing as the warm weather approaches. Indoor kitchens tend to be where family and friends mingle, prepare food and share stories. Why not move that outdoors during warm, breezy summer nights? With an outdoor kitchen, entertaining is inevitable as it will create a gathering space with style and purpose. 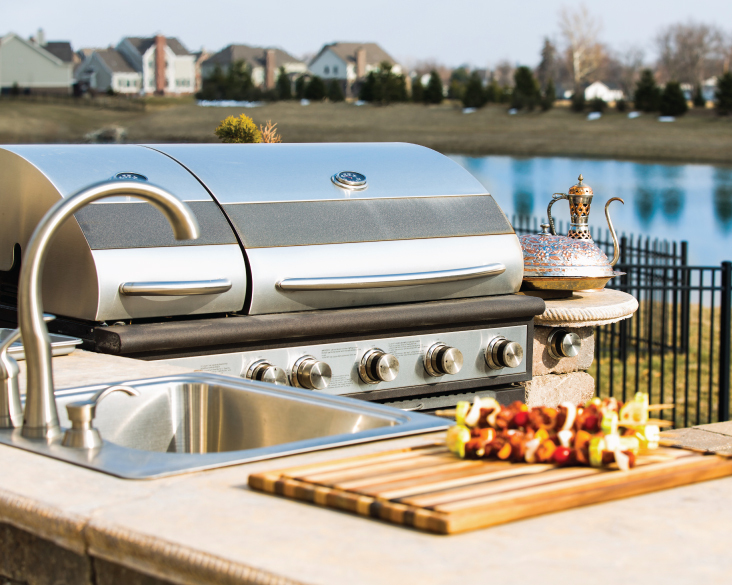 MR Direct Sinks and Faucets has advice on choosing the right components to make any outdoor kitchen the most popular space outside the home. When planning for an outdoor kitchen, size tops the list of things to consider. If a large kitchen area with a dining table and fire place is in order, the special requirements will be considerably large. However, if only a grill, sink and prepping area are needed, practically any yard will do. Applying the kitchen area to an existing concrete patio will not only save money, but space as it can now serve a dual purpose. Along with space planning, figure out which area of the yard is ideal for the new addition. Folks living in Southern California on the edge of a mountain, overlooking the sea wouldn’t put their new living space up against the house, right? The most ideal place in this situation would be the edge of the yard, overlooking the scenic views. Adding to the benefit of scenery is the open escape for billowing grill smoke. Making sure the grill is away from the house and in an open area (facing away from seating) will ensure a clean escape and guests will be happy. hen grills are trapped by an overhang or the side of a house, smoke is easily inhaled by those around, definitely not a way to start a party. On the other hand, an outdoor kitchen close to the house could prove more convenient for small areas without a refrigerator, storage or a sufficient prepping area. Having to carry trays full of food and drinks could certainly become problematic. Hosting a party means being a part of it, not confined to the kitchen while everyone enjoys the weather and company on the opposite side of the yard. With an outdoor kitchen close to the house, the cook will be able to prepare a delicious meal, while still holding a conversation with guests. Now, lets talk about necessities. Observably, the grill is the main focus of any outdoor kitchen and should be at the center of all cooking activity. For unfavorable season changes, choosing a stainless steel grill with a cover is beneficial due to the stain and rust-resistance of the material. Choosing the right grill also depends on the size of the kitchen. For large spaces, one or two large gas grills may be necessary, while a small gas or charcoal grill could be ideal for a small area. Counter space is also at the top of the priority list as it is necessary for food preparation and serving. M Direct suggests having at least 24 inches of counter on either side of the grill if there is no serving area needed. If the space is large and allows for many cubic inches of counter, make sure to place appliances (grill, sink, refrigerator) in a way that doesn’t create a chopped counter. Having a continuous countertop is the key to a fluid workspace and provides many places to set drinks and fix meals. Most outdoor kitchen countertops are made from poured concrete, stone slabs or tile for their durable properties. Poured concrete has become the more popular choice, and can also be the most expensive at about per square foot. Concrete provides a clean, contemporary look without seams. However, if it is not installed correctly, it can be prone to cracking and expensive repairs. Stone is also very popular as there are many choices. Choosing a polished stone with little to no veins will ensure minimal damage from rays and stains. A lighter color stone will reflect sun, while a dark color will absorb the heat and become hot to the touch. east expensive, and a bit outdated, is a tile countertop. Tile provides the consumer with an almost endless amount of style options from colors to patterns to size. It is extremely DIY friendly, but may be prone to cracking is grout is incorrectly applied. At about - per square foot, tile is definitely the most economical choice. The correct components are important to every space, with no exception for outdoor kitchens. Utilizing a sink, refrigerator, grill, cabinets and electrical outlets will enhance the value of the space as well as offer everything needed to enjoy entertaining. Even in an undersized space, a small refrigerator or bar sink can make cooking and entertaining much easier. Once the yard space is chosen and all of the right components are purchased, the planning and layout process can begin. An outdoor kitchen creates focus around one specific item the grill instead of implementing the triangle layout found in a traditional indoor kitchen. The triangle layout creates an imaginary triangle movement between the sink, range and refrigerator. Since most outdoor kitchens are simply an island, there is no need for a fluid triangle layout. Therefore, it is wise to arrange the elements in a comfortable order that allows the host to move around easily while being a part of conversation. Another option besides "build-from-scratch" would be to purchase a ready-made grill module that is equipped to set up and use. These modules aren't necessarily cheaply made, though. Some units can cost anywhere from $800-$5,000, depending on the brand and which pieces and materials are added. Ready-made grill modules are available online and in most home improvement stores, taking the pain out of shopping. Adding the finishing touches to an outdoor kitchen area is the key to bringing the entire look together. While choosing the right appliances is very important, accessories such as seat cushions, grilling utensils, cutlery, plates and decorations will transform a beautiful new outdoor kitchen into a home outside the home.